Before ingesting this product you should consult your doctor if you are not aware of your current health status or if you have any medical condition including, but not limited to: diabetes, high or low blood pressure, cardiac arrhythmias, stroke; diseases of the heart, kidneys, liver or thyroid gland; anxiety, history of seizures, depression, any psychiatric ailment, pernicious anemia or other blood disorders, prostate enlargement. This product is intended for adults 18-50 years of age only. WARNING: This product contains chemicals known of the State of California to cause cancer, or birth defects or other reproductive harm. Do not take this product if you are pregnant or nursing. Do not consume with less than the recommended amount of water or if you are prone to dehydration or are subjected to extremely hot temperatures. Do not take this product with any drugs without permission from your prescribing doctor. Keep out of the reach of children and pets. Many people don't realize the crucial effects that overall health supplements can play on their training. Without the essential nutrients your body needs to survive and flourish, it cannot build a strong foundation that is so crucial to lean mass gains. 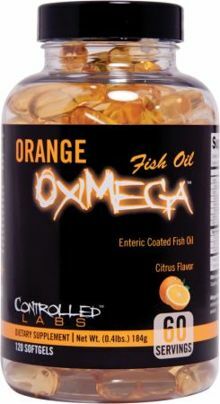 Orange OxiMega Fish Oil was designed to help you establish a strong, healthful, foundation on which to base your training, diet and supplementation. Use along with Orange Triad to cover the health promoting omegas, vitamins, minerals, fruit, vegetables, digestive support, immune support, joint support, and cardiovascular support you’re looking for.